For capturing audio, the Shure ULX-D Single Digital Wireless Bodypack Kit from B&H consists of a ULX-D4 receiver, ULX-D1 bodypack transmitter and WL183 lavalier microphone. It can be used in various environments for audio applications such as, live stage, theater, houses of worship, boardrooms, conferences, public speaking events, and more. It is tuned to Shure's H50 frequency band between 534 and 598 MHz. The systems features AES 256-bit encryption for secure transmission and reception and has a 20 Hz to 20 kHz frequency range. The ULX-D brings a good level of performance to professional sound reinforcement and gets the job done. 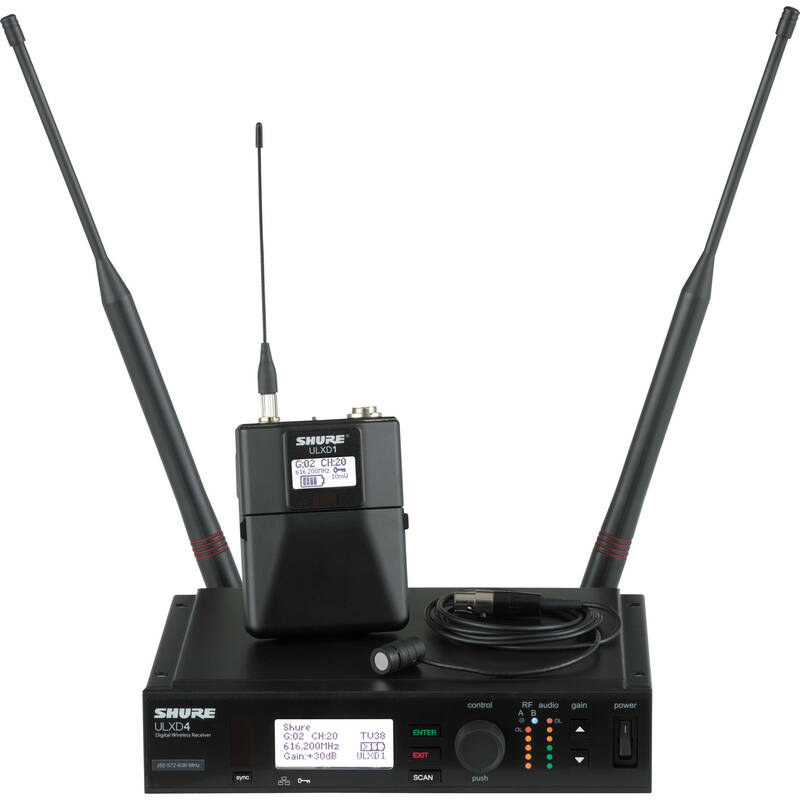 The ULXD4 Digital Wireless Receiver from Shure is designed for compatibility with Shure's ULX-D wireless systems. It is tuned to Shure's H50 frequency band that operates from 534 to 598 MHz. It features 256-bit AES encryption that allows for reception of secure signals. The unit's digital predictive switching diversity is designed to assure you have consistent reception. The ULXD1 Wireless Bodypack Transmitter by Shure is for capturing audio. It can be used in various environments, when paired with a ULXD4 receiver for applications such as, theater, stage, broadcast TV, DJ setups, and more. The ULXD1 compact bodypack transmitter is enclosed in a rugged metal housing with a TA4-M (4-pin male) audio input connector and features a comprehensive LCD display. The ULXD1 features pristine, compandor-free digital transmission for uncompromising sound quality, range and detail. Its 256-bit encryption keeps wireless transmissions secure, and its adjustable RF output power delivers maximum range wherever necessary. The ULXD1 operates on either alkaline AA batteries or Li-Ion rechargeable batteries for up to 12 hours. The 4 foot (1.2 meter) cable terminates to a TA4 female connection, compatible with Shure wireless transmitters and power supply modules. Box Dimensions (LxWxH) 18.346 x 14.882 x 3.622"
Box Dimensions (LxWxH) 12.7 x 4.8 x 3.3"
Box Dimensions (LxWxH) 6.7 x 4.4 x 3.3"